Asked to beautify an unlovely, long-duration mess caused by a natural, spring-fed stream, Steve Sandalis knew from experience that working directly with Mother Nature is serious business. That's why he took a big step back and let the setting guide his efforts -- and his schedule. 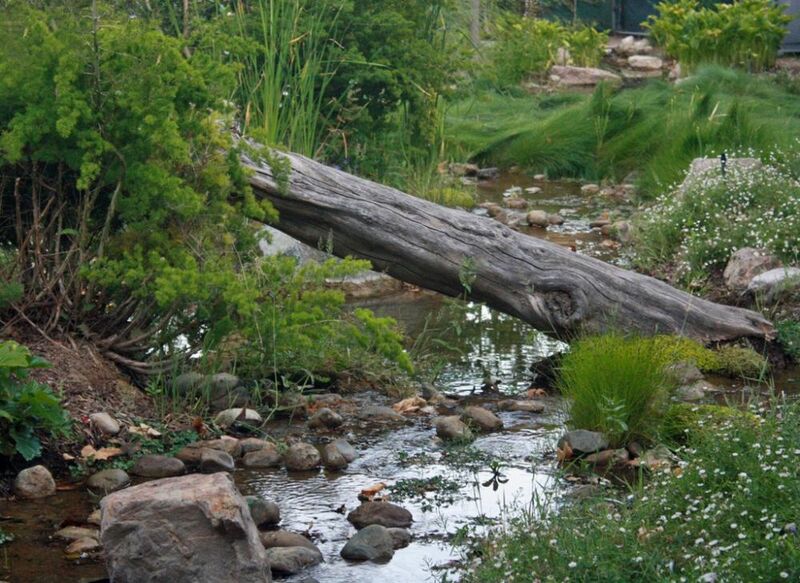 For a watershaper who’s spent a career designing and installing natural-looking ponds, streams and waterfalls using pumps and liners, this project was both an unusual treat and a distinct challenge – a dream job, as I saw it. I was called to the property at the suggestion of a landscape-maintenance company that wanted nothing to do with what the homeowners were asking, and the reason was pretty obvious: A spring-fed stream flowed across the property as it had done for at least hundreds and perhaps thousands of years, and it needed help. Dressing it up and making it both beautiful and reliably functional was no task for a firm that might have had the best intentions but might also have gotten in way over its head. Fortunately, this particular company recognized the risks and knew that we at Mystic Water Gardens (Encino, Calif.) would be up to the task. For my part, I saw what had happened through the years and the various attempts that had been made to pretty things up – and, in all cases, saw how those efforts had broken down. But I could also see the site’s potential and had a sense that it was my professional duty to bring the system back to life with the most natural look possible while managing and beautifying the flow and providing an accessible sanctuary for the clients as well as the critters that frequented the area. The large estate property is situated in Beverly Hills, Calif., right at the base of the Hollywood Hills. Unlike many of the local spring-fed waterways in drought-sensitive southern California, this one is actually quite steady in its flow, which I estimate at about 3,000 gallons per hour. Once they contacted me, I sat through several meetings with the homeowners and took them to see similar projects I’d done. As these sessions continued, they developed confidence that my philosophy and capabilities meshed with their ambitions and we decided to move forward. There was never any hesitation on my part: From my first visit, I could see grandeur in what others mainly saw as an overgrown, swampy mess. I suspect that my clients were among those who had a tough time looking beyond the chaos, because they were excited by virtually every idea I suggested. I described how I liked working with natural contours that reflected the lay of the land, but that I also liked to exploit available elevation changes and work with waterfalls, ponding areas, lazy streams and beach entries that attract animals and birds. From the start, the situation we encountered on site was unusual. A spring-fed natural stream had flowed through the property, uncontrolled, for countless years. More recently, the homeowners had taken various stabs at taming it – but with less-than-satisfying results. As these discussions came to their conclusion, I had a sense that – far from my early suspicion that they’d want to micromanage what I’d be doing – the clients would actually be more than happy to let me roll with my instincts. But despite the warmth of these feelings, I knew there was lots of work to be done. As our first task, we had to figure out how to divert the water off the property. First came the odd revelation that, once it passed hundreds of feet through the client’s property, the water flowed right into a city storm drain. That seemed a sad waste of spring water, but it helped us here because all we had to do was set up a bypass line that would carry the water to the drain via a slightly different path. As it turned out, this was the only mechanical system we installed. Now, where the stream first enters the property, it falls into a small holding pond into which we inserted a pipe with a valve. Rather than remove that fitting once it had served its initial purpose, we left it in place for future occasions when the system might need maintenance or cleaning down the road. Our first step involved diverting the water around its established channel and allowing it to dry out to an extent where we could work with the soil and move large rocks in to define and stabilize the banks. At the same time, we began the process of adding ponding areas, cascades and beach entries. Once we redirected the water, the old streambed quickly dried up and left us with the unpleasant task of mucking out generations of sediment and peaty build-up. Using small equipment and shovels, we then carved out a new pond area, accented and deepened the existing stream course a bit and excavated planter pockets and areas for placement of large boulders. As mentioned above, this wasn’t the first natural waterway we’d worked with, so we already knew well enough that it’s impossible to tame Mother Nature. We hadn’t been quite so wise many years ago, when we were working on a similar project and a long, ill-timed spell of rainy weather washed away our preliminary work and forced us to start over. Lesson learned: This time out, we watched the weather reports to spot a ten-day stretch in which no rainfall at all was in the forecast so we could be assured that a sudden increase in flow wouldn’t overwhelm our work and flood the job site. To make our revision of the water system work, we needed permission from the clients to take a free hand with the extensive landscape area around the waterfeature. Once we completed our work on the ponds, waterfalls and streambeds, we moved beyond the banks to bring the rest of the site into line with the homeowners’ desires. But in the ten days we devoted to revamping the waterway, we had the unusual privilege of not having to think in terms of pumps, filters, skimmers, aerators and other common features of our self-contained watershapes. Instead, we knew that the 3,000-gallon-per-hour flow was enough on its own to keep the entire system crystal clear. The clients were so excited by the new ponding area that their thoughts immediately ran to adding fish. That would be fine, we said, but we’d need to figure out ways to keep them in the pond and add some fish caves to give them a place to hide from predators and the sun. For the duration of the project, this was the only requested change to the original design. The new ponding areas bring real life to the composition – literally. Where before the stream was essentially a drainage ditch carrying water through the property, it’s now a waterway that includes large reflective surfaces and showcases aquatic plants and fish. Beyond that, the work ran as expected. The key was diverting the water so we could work in a “dry” space. Once the weeds, muck and aquatic vegetation had been stripped away, revamping the waterways was quick and, literally, seamless. And that was true despite the fact we bumped up against a few rock outcroppings across the space: We just worked our way around them, incorporating these details into the design and turning them into nice, tuneful transitions along the way. The final design includes lots of nutrient-absorbing aquatic plants: These take care of the bioburden added by the fish population as well as any nutrients that might be flowing from the spring’s unknown source. We also built the stream system with deep banks and plenty of carrying capacity to deal with heavier storm-related flows. The newly contoured system meanders for nearly 350 feet across the yard, flowing from pond to pond and down numerous elevation changes. This gave us ample opportunity to work with different bank forms, channel widths, water depths and decorative features along the way. The overall system is nearly 350 feet long and holds approximately 27,000 gallons of water in constant transit. At its narrowest, it’s just three feet wide. At its broadest, it extends out to 15 feet at the beach entries. As mentioned previously, we used no liner, knowing the existing natural watercourse had done a fine job with no such assistance. 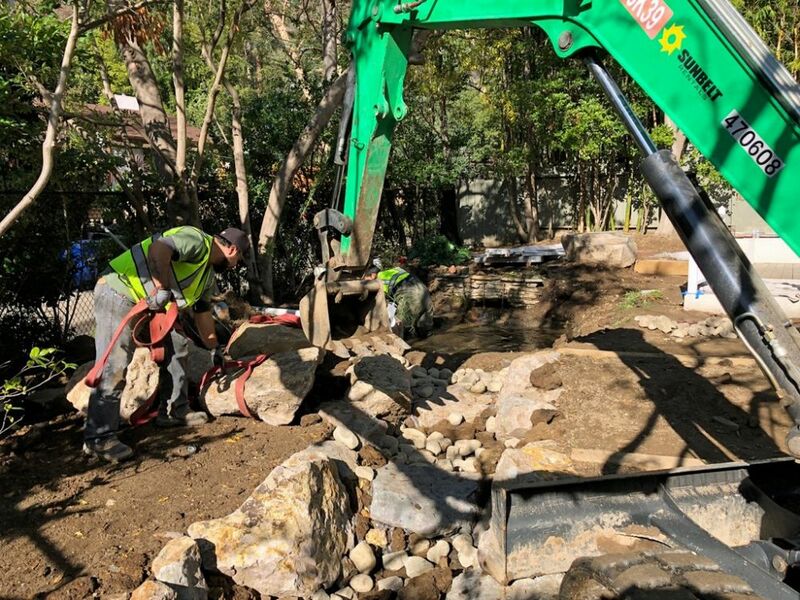 But we did insert stabilizing sections of underlayment under large boulders and beneath the waterfall – all hidden under smaller rock and cobble. There are some very large trees near the water, and we did our best not to encroach on their root systems in shaping the waterway. We figured their falling leaves would become an issue at times, but with a brisk flow rate through the system, we’re thinking they will be little more than an occasional maintenance issue. From start to finish, the job kept us on site for a month. It was always stimulating work, because we kept coming across little features that led us to improvise around them, such as the nearby trees and the various outcroppings we discovered along the way. A final touch was the addition of the deadfall tree: We’d salvaged it from a large project we’d done in northern California’s wine country a while back: This seemed like to the perfect opportunity to return it to a truly natural setting. Such a reversion to native conditions was, in fact, our goal throughout the project. It’s rare for a pond specialist to get a chance to work with a spring-fed watercourse – particularly one with such a reliably high level of flow – and we took special pleasure in respecting the authenticity of the system while cleaning it up and making its many virtues completely apparent. It was clear to us when we started that the clients were a bit anxious about what was to become of their backyard, but with their trust and support, we delivered as promised – and they’re in love with the outcome, from the stream’s magnetic appeal to local wildlife to the pleasure of brightly colored fish darting through their new pond. 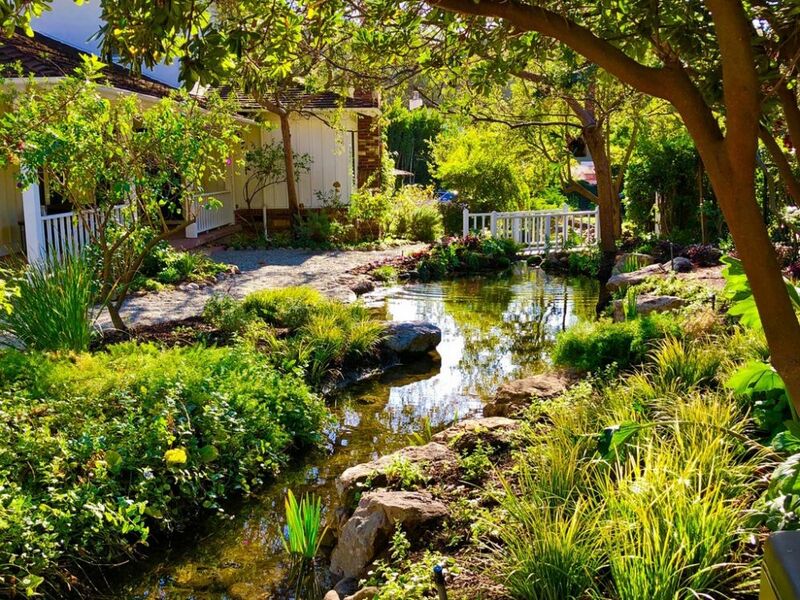 Steve Sandalis is founder and president of Mystic Water Gardens, an Encino, Calif.-based design/build firm specializing in custom streams, waterfalls and ponds. Sandalis founded the firm in 2000 after several years of pursuing watergardening as a serious hobby. Since then, he has immersed himself in the arts and crafts of watershaping and currently designs and installs highly detailed features for a range of mostly residential customers across the United States. He may be reached through his web site: www.mysticwatergardens.com.